Bill Davidson, chairman of Burghead Community Council and Albert Main, member of Burghead Community Council and neighbour to the dump site. Fears have been raised that bin bags stuffed with building materials dumped at a Moray harbour will spark a spate of fly-tipping. 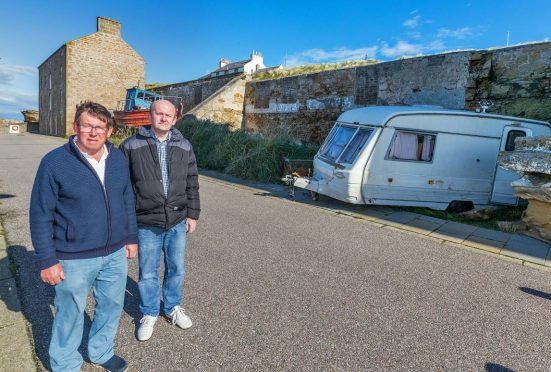 Dozens of liners have been left near the quayside in Burghead, along with a caravan with smashed windows. Patrick Thirkell, who moved the materials there from the Old Mills in Elgin, insists the materials are only being stored there temporarily. But the mess has provoked anger from locals who fear the site of piles of bin bags next to the harbour may encourage people to leave rubbish there. Bill Davidson, chairman of Burghead Community Council, said: “It needs to be moved. If folk see rubbish there they will just put more rubbish on the top of it. “Nobody in Burghead wants the stuff there. The thing that bothers me the most is that we don’t know if there’s more stuff to come from Elgin. Madge Bray lives next to the site and believes the building materials in some of the bags may be “rotting”. She said: “Some of the bags have split and are ready to have their contents dispersed. This is a harbour not a rubbish dump. Mr Thirkell has been locked in a long-running dispute with Moray Council about the Old Mills. In June the former RAF man was forced to clear the site for the third time after he lost an appeal against enforcement action. Now authority planners are considering whether to take similar steps in Burghead. Moray Council convener James Allan inspected the site for himself yesterday. He said: “I got quite a shock when I saw it. It’s his own ground but the caravan is coming on to the pavement so it’s quite dangerous. It’s full to the roof with rubbish too. This week Moray Council explained an assessment would made at the site to determine whether any action should be taken. The authority declined to comment further yesterday.